Arrived at 8.30am following our 12 hour bus journey from Hanoi, which was freezing because of the air-conditioning!We were hassled as soon as we got off of the bus by touts trying to get us to go their hotels, we declined and headed for a bacon, egg and cheese breakfast sandwich.As we walked back past the bus stop a French couple that had been on our bus but were not stopping in Hue recommend a hotel for us.The hotel was only a 2 minute walk but it was fully booked so we went next door and rented a nice room with a deep bath for Ã¯Â¿Â½6. 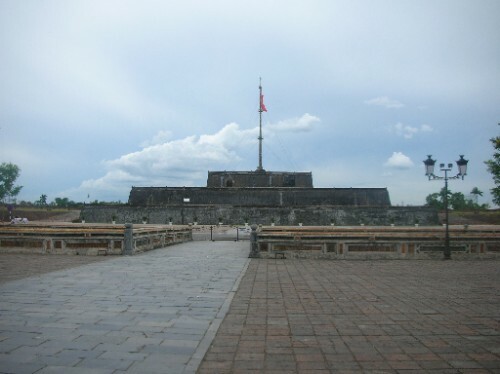 We only planed on being in Hue for 2 days so we went straight out for a walk around the town. We ended up deciding that the best way to see the Imperial City and Citadel was to hire a motorbike, we stopped at a travel agent who advertised renting bikes and we had to wait for someone to deliver it.Wayne had a quick 2 minute introduction as there was no way I was driving it!We headed out over the river me holding on tight, we managed to go the wrong way down a one way street and round in a big circle before we found the bike park and the entrance to the Imperial City.As you enter through the main gate, which is below the watchtower you see a lake full of Koi Carp.Over the bridge you enter the palaces and pavilions, some of the area is being restored so there were areas that we could not enter.There was a Royal reading pavilion which had a small pond in the front of it and was very picturesque, further into the city there was another huge lake.We walked all the way around and stopped at the art gallery to look at some of the paintings as well as a small museum holding some artefacts from the era. We headed back toward the bridge on our bike and it stopped in the middle of the road, we had run out of petrol! We started to push and then an old lady started shouting and running over to us, she had petrol in a water bottle we brought is off of her for Ã¯Â¿Â½1.50 (robbed) and headed back, the gears on the bike were rubbish and every time Wayne changed gear he had to really stamp, we'd had enough so we went back to the agent.After some complaining we got most of the rental money back and the money for the petrol, which was good as we were not out of pocket.We walked back along the river and were going to take a boat trip, but we were hassled too much and in the end got so fed up we just went back to the hotel.Before dinner we stopped and had a drink, I had a Vietnamese cocktail or 2 and then we went for some pasta, before heading to a DMZ bar for a couple more drinks. The next day we had an early start (6am pick up) for our DMZ (Demilitarized Zone) tour.The DMZ is an area that divided North and South Vietnam and saw most of the action during the Vietnamese war.The journey took us 3 hours out of Hue, where we stopped for our included breakfast and to pick up our guide.The guide had excellent English and started off but giving us some history of the SMZ and the surrounding area.The tour was due to be mostly by bus allowing us time to get off and take pictures, our 2 main stops were Vinh Moc Tunnels and air Khe Sahn base. Our first stop was Hien Luong Bridge and the Ben Hai River, which signals the start of the DMZ.We then moved onto the tunnels which were used during the war as a shelter for locals during the war, the area was bombed by the Americans who used special drilling bombs to try and destroy the tunnel network.We got inside and after 10 steps Wayne turned round he hates feeling claustrophobic, so I had to go alone.There are 3 levels of tunnels and 13 entrances most of them are on the beach with the remaining 5 on the hillside. The tunnels contain small caverns which families used to live in, there was even a maternity ward made down there and 17 children were born in it. The tunnels are quite narrow and we emerged out on Cua Tung beach.We took another entrance back which had more steps and in some places I even had to duck, this took us to another entrance on the hillside.We then made our way back for lunch, which was really early, but we thought we should eat we had noodles and they were not that nice.Our next stop was not for about an hour, we reached the Ho Chi Minh Trail and Dakrong Bridge, which were used by during the Vietnam war by the North Vietnamese Army to ferry equipment from the North to the South via Laos, the trail was meant to be invisible from the air.We then made our way up toward the Laos boarder past an Ethnic Minority Village, the houses are built on stilts and the inhabitants are extremely poor.We drove past Rock Pile, which was used by the Americans as an observation point, where everything had to be delivered by helicopter due to the difficulty of getting here.The next stop was Khe Shan base an American base, which was the site of one of the worst battles in the war.The area was badly destroyed that nothing grew for years and years although coffee plants are now growing.At the base there is now a small museum which with pictures and artefacts from the base.Outside there are some US military helicopters and some locals selling dog tags and souvenirs that have been found in the area.It was quite a strange place to be to imagine that not all that long ago this was an American base and then a war zone for 9 weeks, while the NVA took the area. The journey back to Hue, was about 3 hours and it started to rain, our seats only seemed to be below a leak in the roof and we got a little wet!In the evening we went for a meal near to the hotel I had a Prawn curry with rice, while the rain continued to pour down.